The Audubon Golf Trail in Louisiana was founded in 2001 as an answer to Alabama’s Robert Trent Jones Golf Trail. Back then is was a collection of just six golf courses, each one unique and with an enthusiasm to bring Louisiana to the forefront of the golf travel industry. Today, the Audubon Golf Trail lists 12 member courses and it seems the number will continue to grow. Named for woodsman and artist John James Audubon (1785-1851), the Audubon Golf Trail meanders southward from Shreveport to New Orleans, taking in along the way New Iberia, Lafayette, Lake Charles, Atchafalaya and a good many more places with names even more tough-to-pronounce. And talking of names: Audubon Golf Trail course designers include some of the most famous names in the industry - Louisiana native David Toms, Hal Sutton, Steve Elkington and the master himself, Pete Dye. All of the courses on the Trail are members of the Audubon Cooperative Society, a dedicated group of folks with a dream. The Society’s objective is to preserve Louisiana’s unique natural environment and to preserve the heritage of the game of golf. The Audubon Golf Trail starts but doesn’t end with golf. Along the way you’ll find plenty of distractions… well… attractions. These include unlimited opportunities to sample that for which Louisiana has become so famous, its cuisine. Then, of course there’s jazz and music in all its vibrant, Cajun forms. And let’s not forget the fishing – the bayous of southern Louisiana offer some of the best fishing in the world. Finally, there’s New Orleans itself and, of course, Bourbon Street. Hurricane Katrina, and to a lesser extent Rita, was an event no one is ever likely to forget. Six of the Audubon Trail Golf courses lay squarely in the path of both hurricanes and were devastated. One course lost more than 1,000 of its trees. I’m happy to report, however, that all six courses have recovered and are playing better than ever. Audubon Park Executive Golf Course, a par 62 course located in historic uptown New Orleans, is spread across 81 tree-lined acres on St. Charles Avenue and is the country’s only course accessible by streetcar. The Atchafalaya Golf Course at Idlewild is one of my personal favorites. Designed by Robert von Hagge, the 7,533-yard course is surrounded by the rich wildlife and incredible natural beauty found only in the heart of the Atchafalaya Basin. Gorgeous! Black Bear Golf Course is on approximately 300 acres atop the Macon Ridge. 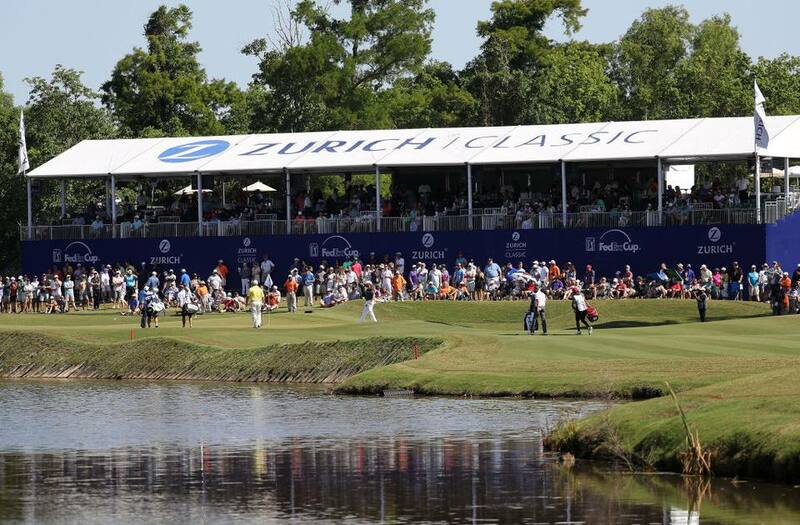 The course was designed by Bechtol Russell Golf and built by Weitz Golf International. Black Bear is just a super golf course. The Carter Plantation, near the historic town of Springfield and just 30 minutes from Baton Rouge, is the signature design of LSU alumni and former PGA Champion David Toms. Cypress Bend Golf Resort on the Texas-Louisiana border incorporates the 186,000-acre Toledo Bend Lake: ten of the 18 holes play along the lake’s shores and across its coves – exciting golf, good fishing, too. The Gray Plantation, which is located just outside of Lake Charles, was ranked 75 out of 100 on Golf Digest's list of "America's Greatest Public Courses" in 2005. The Island, par-72 course of over 7,000 yards where water is in play on 17 of the 18 holes. There are 54 bunkers, nine lakes, and Bayou Plaquemine and Bayou Jacob to contend with as you wend your way around the course. OakWing Golf Club is a unique Jim Lipe design set upon what once was England Air Force Base. A 7,043-yard blend of the natural beauty of Louisiana bayous and lakes, and featuring fairways lined with old-growth giants, rolling hills and undulating greens. Olde Oaks Golf Club, near Shreveport, was designed by PGA Ryder Cup Captain Hal Sutton. Sutton, a native of the area, calls his first signature course one of the finest in the region. Tamahka Trails Golf Club is a course of great natural beauty and a seemingly endless succession of challenges. TPC Louisiana, just 15 minutes from the French Quarter, is the crown jewel of the Audubon Trail. TPC Louisiana was designed by Pete Dye in conjunction with Steve Elkington and Kelly Gibson. The Wetlands Golf Club, in Lafayette is the newest member of the Audubon Golf Trail and, having opened in April 2006, is also the newest golf course on the trail. The Wetlands, deep in the heart of the bayous, James Lee Burke country, features the region's many bayous, lakes and wetland areas. The formation of the Audubon Golf Trail was a stroke of genius. Add to it all the rest of the goodies Louisiana has to offer and you’ll soon realize why the state is rapidly becoming one of America's top travel destinations. To book a Louisiana golf vacation to the Audubon Golf Trail call 1-888-AGT-INLA (248-4652); please visit www.audubontrail.com.